BlackBerry PlayBook gets official Bluetooth keyboard | BlackBerry Blast! The BlackBerry PlayBook is getting an official Bluetooth keyboard. Electronics retailer The Source has the exclusive on the light weight Bluetooth keyboard and case for the BlackBerry PlayBook. What makes this keyboard different? It is the official RIM keyboard for the BlackBerry PlayBook. There are other keyboards available, but this is the only one that RIM has released. Similar keyboards and cases are available for Apple's iPad, so it's nice to see RIM stepping it up. Anything that can make the PlayBook more usable is welcomed. 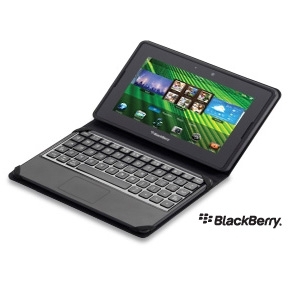 �The multi-touch functionality lets you navigate through your BlackBerry PlayBook tablet like a laptop or desktop computer,� according to the product notes on The Source�s site. The keyboard can also be charged using the PlayBook�s charger. The new keyboard will be available for $99.99 on March 23.